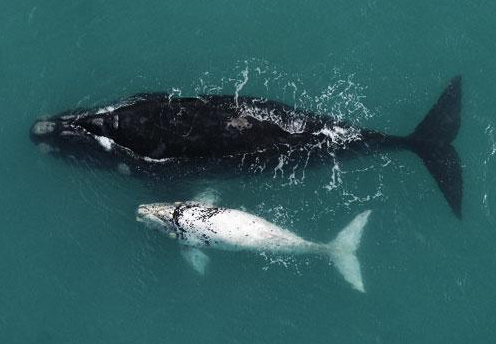 Southern Right Whales flock to the bays of De Hoop Nature Reserve to nurture their young. 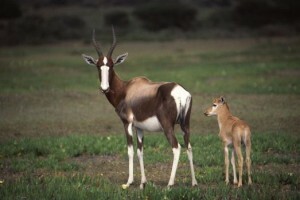 Bontebok – an endangered species – graze De Hoop’s lands in surprisingly large numbers. Eland and Cape Mountain Zebra are at home in the reserve too, along with ostriches, the scurrying yellow mongoose, a variety of other mammals and a large array of birds. Hugging the coastline east of Bredasdorp, De Hoop is a paradise of marine reserve, milk-white sand dunes and vlei. 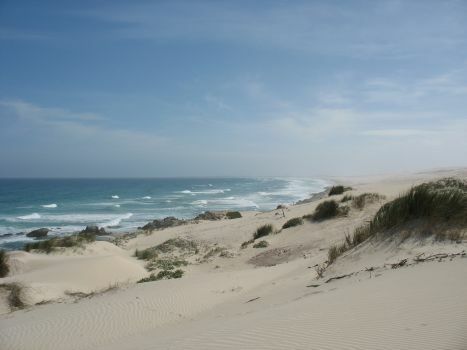 It’s one of the largest protected marine areas in the whole of Africa. The coastline is utterly spectacular, and made accessible with pathways and boardwalks meandering between the sea and sand dunes. You’re king-of-the-castle up on the dunes, beautifully ridge-patterned by the seabreeze. 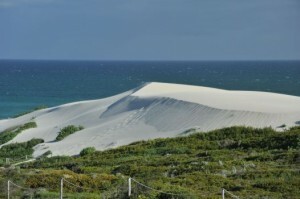 The dunes make an incredible vantage point for watching whales in the swells. Down along the shoreline, there are wonderful rock pools to explore, which reveal all sorts of sealife. It’s also a world of vlei and fynbos, and a multitude of birds, including waders around the vlei, blue cranes and the rare Cape vulture. Swimming pool at Opstal Manor. 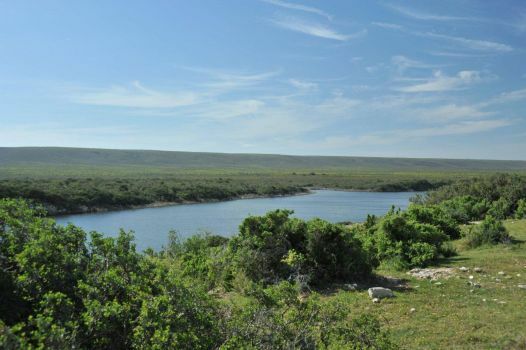 De Hoop Collection’s accommodation ranges from luxury catered accommodation in the historic Opstal Manor House (a National Monument), to self-catered cottages and rondawels in a variety of settings and variously configured. 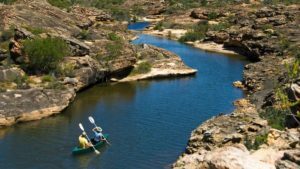 There really is something for everyone who wants to live close to nature and discover the wonders of the reserve. 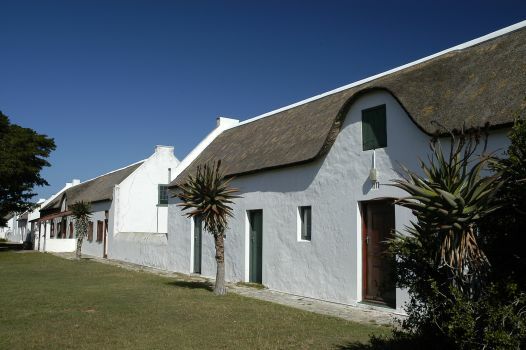 The beautiful Melkkamer Manor and cottages are set a good distance from other accommodation in the reserve and provide an extra measure of seclusion. Currently being rebuilt, Koppie Alleen rests up on the dunes and is the closest accommodation to the beach. The Fig Tree Restaurant serves delicious meals if you’re booked on a catered basis, or self-catering but fancy the odd treat. Dinners are three-course set menus with a small choice. An absolutely stunning Getaway. So unspoilt. Great variety of accommodation too – something to suit everybody. Couldn’t agree more. 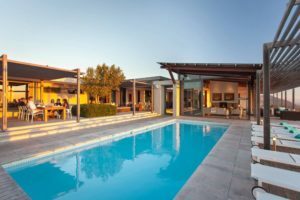 The choice of accommodation is excellent, and what’s really great is that if one chooses to self-cater, there’s a wonderful restaurant where you can still book an excellent 3-course dinner “out”, or a breakfast treat.